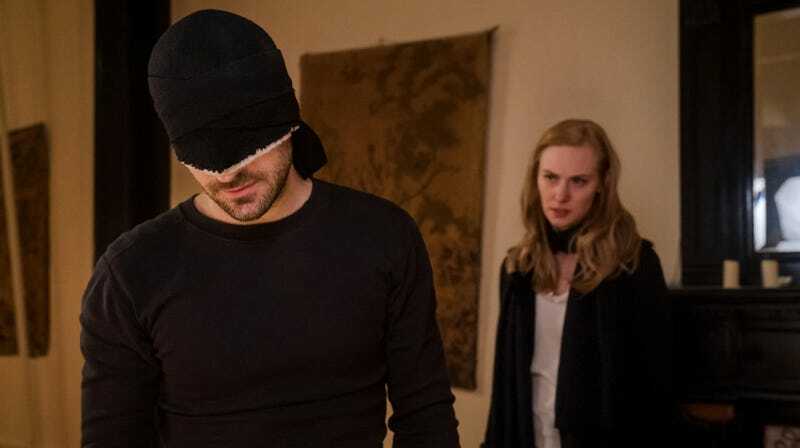 Charlie Cox as Matt Murdock and Deborah Ann Woll as Karen Page. Daredevil’s upcoming third season is set to get Matt Murdock back, forgive me, to his old habits begging God for forgiveness and wearing all black when he’s doing his thing. The latest teaser for the show, though, promises that someone else is about to suit up in one of their iconic comics’ looks. It’s been a while since we last caught up with Vincent D’Onofrio’s Wilson Fisk who was then doing what he does best and using his influence to orchestrate Frank Castle’s release from prison. From the looks of it, Fisk’s soon to be sprung himself and when he’s back in the city he’s fought so hard to take over, he’ll be wearing that that iconic, sharp, white suit of his complete with his best cufflinks. Wilson Fisk explaining himself to someone. With Matt back in black and Fisk in white, it seems as if this season’s going to pit the hero and villain against one another in yet another battle of morals highlighting how at odds their perspectives on justice and righteousness are when Daredevil returns to Netflix on October 19.